We select and source most of our range directly from manufactures based in Italy, Spain, Portugal, Brazil and China. This gives us much better control over availability, quality and price, 3 key factors in providing a happy tiling experience. To date our growth and success has come from providing a combination of a very large selection of importer priced tiles, tools, installation materials and accessories displayed in large showrooms, and supported by knowledgeable staff committed to providing fast, friendly and efficient service. Our showrooms and warehouse now occupy over 100,000 sq feet in 13 locations around the North Island. Some tile importers take your order and then pass it on to a factory overseas to avoid sitting on stock that may not sell, this can create huge lead times of months before you get your order. 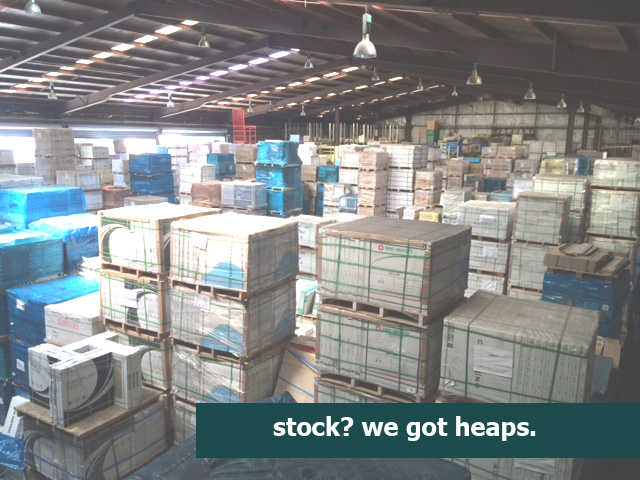 We have over 180,000m2 worth of stock waiting for you!